Twenty-four hours later than planned, George ‘Johnny’ Johnson was a passenger in the BBMF Lancaster this morning when it flew from Coningsby at about 0800. 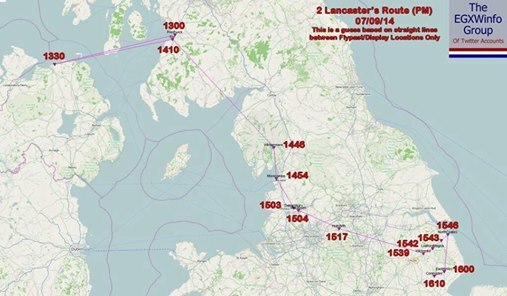 The Lancaster’s route took them over Scampton and the Derwent Dam before landing again at Scampton about an hour later. Johnny flew in the bomb aimer’s position, just as he did when he took off from Scampton 75 years ago yesterday on the Dams Raid. The flight was postponed from yesterday by weather conditions. The fact that Johnny was always scheduled to be a passenger was a very well-kept secret, as it was feared that if it became known he was going to be on board the traffic problems would have been even worse. The worst-kept secret of the events to commemorate the 75th anniversary off the Dams Raid is out! 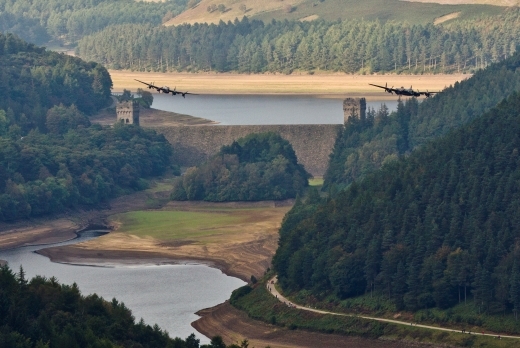 It has been officially confirmed today that the BBMF Lancaster will perform a flyover at the Ladybower Dam in the Peak District’s Derwent valley on Wednesday 16 May at approximately 12.05pm. In April and May 1943, the reservoir and dam were one of the training locations used by 617 Squadron in the run up to the Dams Raid. 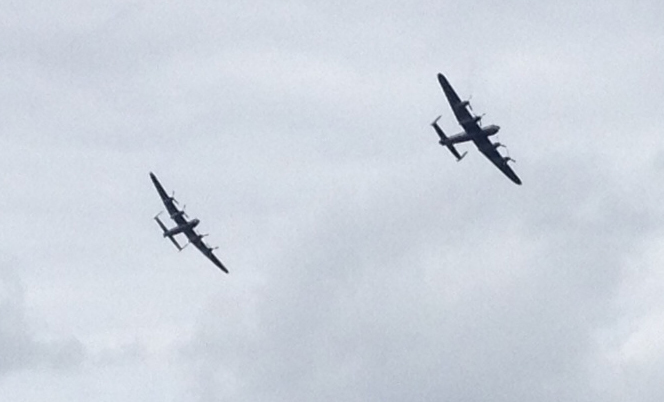 The Lancaster will fly over RAF Scampton and then move on to the Derwent valley. It will perform two passes over the dam before going on to fly over Chatsworth House, the Rolls Royce plant in Derby and the Eyebrook reservoir in Leicestershire. The authorities are keen to inform you that this event is of course weather-dependent, and in the event of cancellation due to inclement conditions there will not be another date. Traffic congestion is expected to be very high, and members of the public are urged to use public transport if possible as private car parking will be very restricted. Previous events at the dam have resulted in traffic jams lasting up to six hours. Note that the nearest rail station is at Bamford, 2 miles from the dam (wear walking boots). Check this information from the Peak District National Park and this from Derbyshire County Council. There is more information on the BBMF Facebook page. This does not say which base the Lancaster will be using on the day, but it is likely to be its home station of RAF Coningsby. A little later this morning the Mynarski Lancaster, affectionately known as VeRA, will take off from RAF Coningsby and begin the long journey home to Hamilton, Ontario. Its stay in the UK is over, but it has left an indelible memory with its many appearances alongside its cousin from the Battle of Britain Memorial Flight. The last six weeks have seen the world’s only two flying Avro Lancasters make stately progress through the skies at airshows and other events up and down the land. The public has responded by turning out in their thousands at each event, thrilled to see the pair and experience at first hand the roar of eight Merlin engines. Where better to make a final appearance together than flying down the Derwent valley in Derbyshire? In the spring and early summer of 1943, the Ladybower Dam was one of those used by the newly formed 617 Squadron as it practised low flying over water for the Dams Raid. It has become a traditional place for salutes to those who took part in the Dams Raid and the other aircrew of Bomber Command, 55,000 of whom were to die during the Second World War. They hailed from all parts of the UK, and from many other countries both inside and out of the Commonwealth. 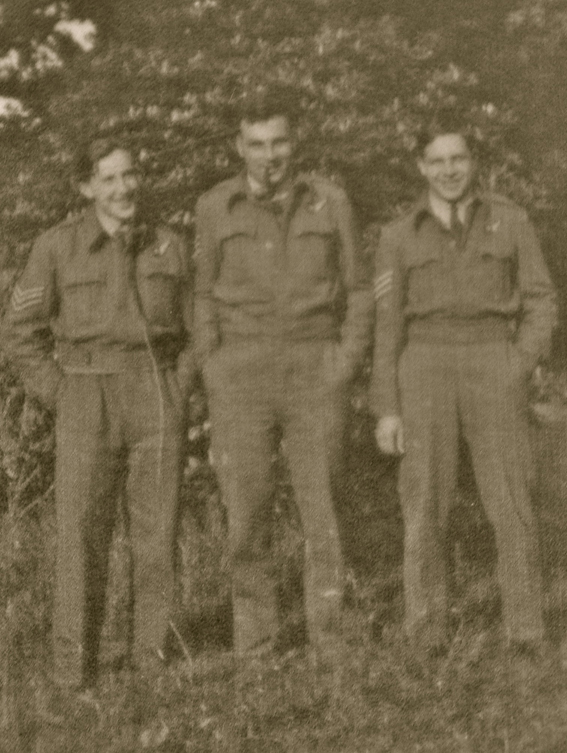 Chief amongst these were the Canadians, who provided 30 of the 133 aircrew who flew on the Dams Raid. Last Sunday afternoon, the pair flew down the valley together and made three passes over the dam. Flying as a passenger in VeRA was 90 year old Sydney Marshall, a wartime member of 103 Squadron, who is a volunteer guide at the BBMF. A report about his experience is on the BBC website, here. There was also good coverage in the Telegraph and the Mail. Have a safe journey home, VeRA, and many thanks for taking the trouble to visit and provide so many people with so many memories this wonderful late summer season. Yesterday morning dawned bright and clear across most of Britain and Ireland, but apparently not in deepest darkest Lincolnshire. This must have caused great despondency amongst the planners at the RAF Battle of Britain Memorial Flight at RAF Coningsby because yesterday, Saturday 6 September, was the first day in a weekend which had been scheduled for months to be the one of the busiest for the world’s last two flying Lancaster bombers. One of these (nicknamed Thumper) belongs to the BBMF and lives at Coningsby, the other (Vera) is owned by the Canadian Warplane Heritage Museum, and has been over in Britain for the last month visiting its cousin and participating in a number of joint displays. 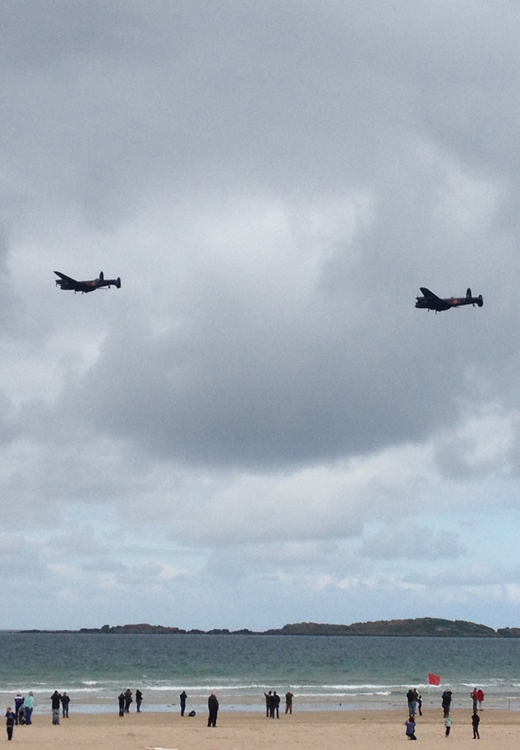 Crowds up and down the country have oohed and aahed as the pair have swooped low over wartime airfields. Black tie dinners have been held under their wings. Grown men have been seen in tears. But yesterday, all flying had to be cancelled as it was far too foggy and wet for the pair to be allowed to take off. Much consternation up and down the land. Twitter was abuzz. Facebook was full of queries. Fortunately, there is nothing that our chaps in the services like more than a challenge. Could they shoehorn most of the BBMF’s scheduled appearances over two days into one busier-than-ever Sunday? Well, of course they could. Here is a map showing just how much of northern England, southern Scotland and northern Ireland the elderly pair covered just this afternoon. Bear in mind they had done a similar loop between 0900 and 1300 this morning. From my point of view, I was particularly pleased that the hour taken to fly the two Lancasters and their Spitfire escorts across the Irish Sea to display to a huge crowd on Portrush Strand had remained in the schedule. This was the only chance that anyone living on the island of Ireland would have to see them – and their appearance this side of the water was a fitting tribute to the hundreds of aircrew from north and south who had served in the RAF during the Second World War. One of these was a native of Portrush itself, rear gunner Richard Bolitho, who took part in the Dams Raid and was killed when his aircraft, piloted by Bill Astell, collided with a pylon near Marbeck in Germany, en route to the Möhne Dam. Was it worth the 300 mile round trip to spend 15 minutes on a beachfront staring into the sky at two aircraft built some 70 years ago? Like hell it was. It was a chance to connect with my family’s history as well as that of the nation, and to reflect on both. The Lancaster bomber has rightly become a symbol of the triumph of freedom over tyranny in a war whose shared memory is now fading from view, as those who fought in it – or even recall it – pass on. Long may this elderly pair soar in the skies – above our islands, and also above the vast Canadian plains and mountains. It was a privilege to see them both on this day, 7 September 2014, and many thanks are due to all those who made it possible. More pictures from today at Airwaves Portrush from the organisers, Coleraine Borough Council. 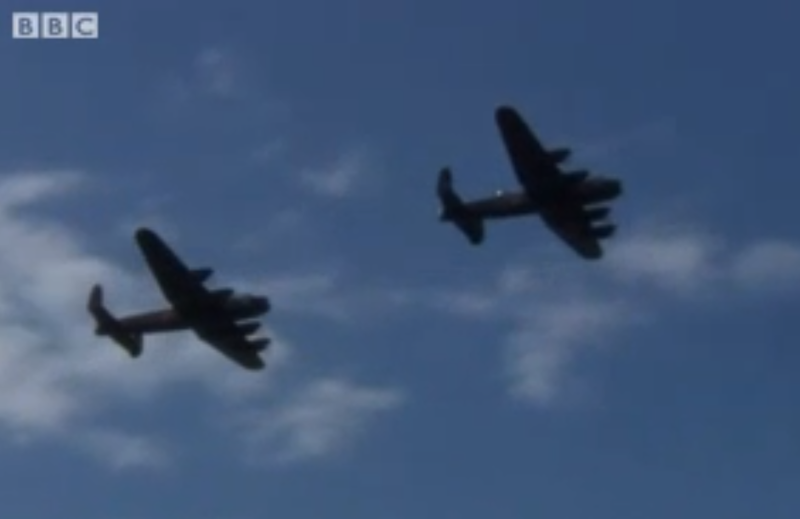 There was a report on BBC East news last night on the first flight together by both Lancasters. They took off from Coningsby on two occasions and flew several practice manoeuvres. The first scheduled public appearance is at Eastbourne Air Show at 1500, later today and on other days this week. Also at the Combined Ops Show, Flying Proms (Shuttleworth), Herne Bay Air Display and Sywell Great War Airshow later this week.